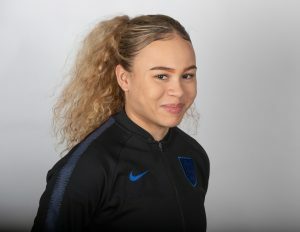 Ebony Salmon, Lucy Fitzgerald and Emily Syme hit two goals apiece as England began their Euro Under-19 Championship Elite Qualifying Round with a bang REPORTS TONY LEIGHTON. 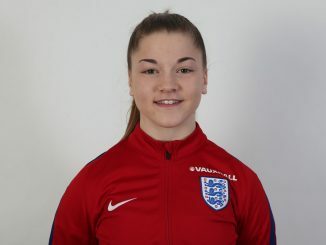 Substitute Lauren Hemp completed the scoring in a convincing victory that understandably pleased coach Rehanne Skinner. “We did really well,” said Skinner. “The girls applied the game plan we’d put in place and I was really happy with that. Playing on the St George’s Park ‘show pitch,’ used by the men’s senior team for training matches, England were in control from the start. After the Turkey goal survived a couple of close calls Manchester United striker Salmon put England ahead with a low, angled shot in the 25th minute. The visitors almost equalised a minute later as winger Birgul Sadikoglu sent an 18-yard shot narrowly wide. 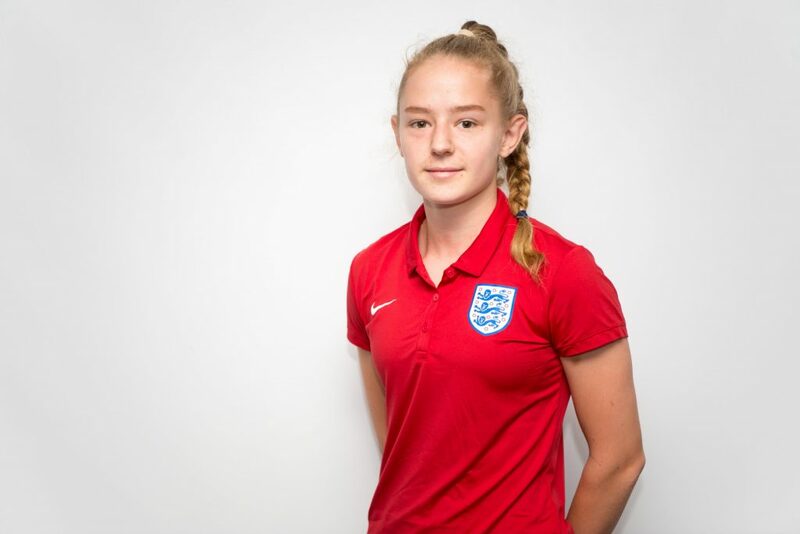 But the young Lionesses doubled their lead in the 33rd minute, Millwall Lionesses winger Fitzgerald striking the ball home from just inside the penalty area. Fitzgerald turned a long range Jodie Hutton shot over the line to claim her second goal three minutes later. And a further three minutes on the game was over as a contest when Salmon, currently on loan at Sheffield United, ran through to hit goal number four. For good measure England went nap three minutes before the interval, Salmon crossing for Yeovil Town midfielder Syme to sweep the ball home. 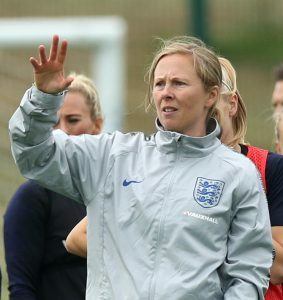 A series of second half substitutions disrupted the flow of the Lionesses play, but they continued to spend the vast majority of the game in the opposition half. A clever free-kick routine lead to the sixth goal, Syme completing the move with a crisply struck 12-yard shot. As the home side began to build the pressure Manchester United midfielder Lauren James and Hemp both hit the woodwork . Manchester City striker Hemp then tricked her way through Turkey’s back line to slide in the final goal nine minutes from time. 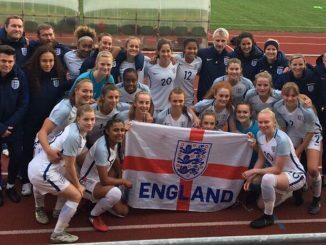 England now face Sweden on Saturday and Italy on Tuesday as they look to clinch a place at July’s Euro finals in Scotland. “The next two games will be tougher,” said Skinner. “They’re both strong nations who finished top of their earlier qualifying groups. 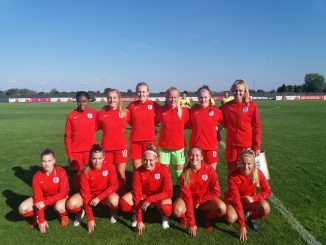 England (4-2-3-1): Ramsey (Manchester United); Smith (University of Oklahoma), Cashin (Rider University) (sub Hartley (Sheffield United – on loan from Manchester United) HT), Morgan (Manchester City) (sub Eaton-Collins (University of Florida) HT), Neville (Millwall Lionesses); Palmer (Manchester United) (sub Hazard (Arsenal) HT), James (Manchester United); Fitzgerald (Millwall Lionesses), Syme (Yeovil Town), Hutton (Aston Villa) (sub Rutherford (Bristol City) 62); Salmon (Sheffield United – on loan from Manchester United) (sub Hemp (Manchester City) 62). Turkey (4-2-3-1): Cam; Kartal, Taskin, Kaya, Tutuncu (Cevik HT); Atac (Bora 76), Kuru; Gurel, Incik, Sadikogu; Ozturk (Ilter 60). *Can you work out the sort of headline we could have used? Stuffing and all that. We rose above it.